Charge without taxes to foreign professional customers with a valid intra - EU VAT number. Intra-Community VAT numbers "cleaned" in the database and to detect false numbers or errors in the VAT number, this cleaning is done directly when registering the VAT number in the address, but also by a complete verification system in the module configuration. 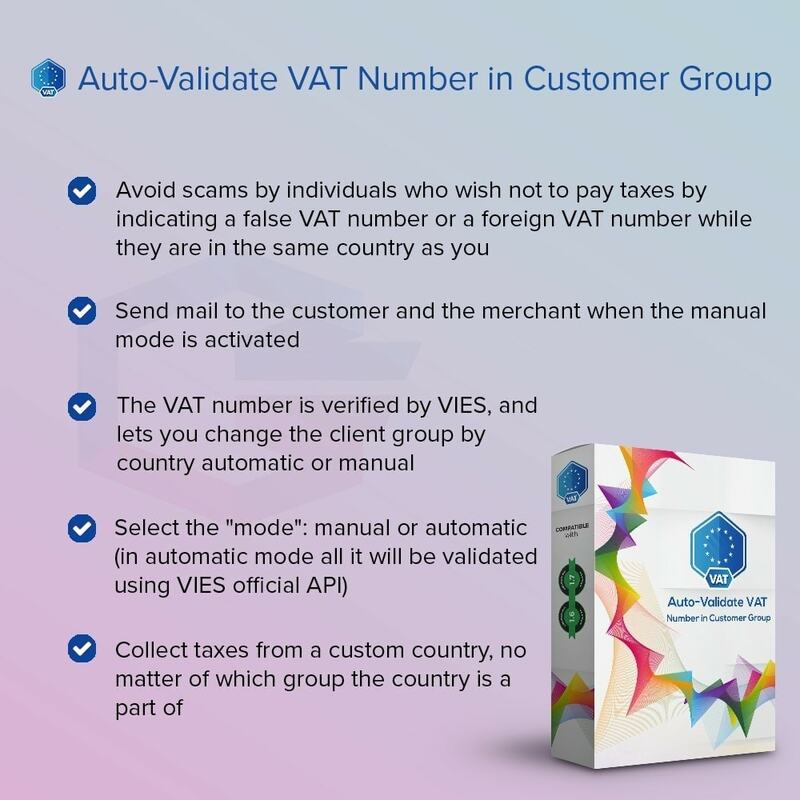 The VAT number is verified by VIES (http://ec.europa.eu/taxation_customs/vies/), and lets you change the client group by country automatic or manual. You can assign a group of client countries fully automated. The client can be in a client group corresponding to his country if your trade policy differs for each European country. You can also require Registered customers go to their VAT number (they will be stuck on the "My Account" to enter their VAT number). Auto-Validate VAT Number in Customer Group module is easy to install and use. To install, simply upload the zip and start the web based Installation via your Prestashop back-office. Also, we can perform the installation for you, at no cost. Auto-Validate VAT Number in Customer Group is the most complete and flexible system on the Prestashop marketplace.